Do you ever get in the middle of development, or attempting to diagnose a problem on a server, and wish you could just clear out the logs without having to stop your server? I do all the time! As a result, I created a simple jython script that allows me to force a log file rollover on WebSphere Application Server effectively clearing out the current log file, and allowing me to start with a new, fresh log file. The script I created, shown below, will get the applicable server information, specify a rollover log file location and file name, and force the server to rollover the SystemOut.log file. I realize that this script could be optimized and improved upon, but for my basic needs of doing development and debugging it works just fine. NOTE: The script below is targeted towards the SystemOut.log stream/file, but could easily be modified to include the SystemErr.log stream/file. To execute the log file rollover script, place the file somewhere on your system from which it can be read. 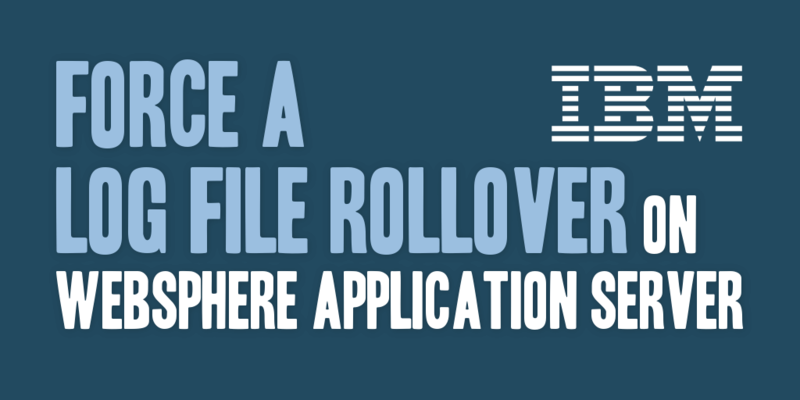 Next, navigate to the WebSphere Application Server profile bin folder of the server you will be targeting. From that bin folder, execute the following command properly referencing the rollover log script in its readable location. The script can be downloaded as a plain text file here: rolloverLogFileImmediate.txt. You’ll want to modify the file extension to .py or .jy to get it to run using the wsadmin command.